Though no blood has been shed — yet — things could get ugly as two of the Internet’s deepest discounters try to undercut each other, with Overstock.com (or O.co, if you’re a marketing moron) announcing it would beat Amazon’s pricing on books, only to have Amazon strike back with price drops of its own. Overstock’s promotion promised customers that it would beat Amazon’s prices on books by 10%, but that comes with a massive asterisk, as it establishes the price to beat at whatever Amazon was charging on July 22. And so all Amazon had to do was drop its prices about 10% on the titles that are available on both websites. Which it apparently did. GigaOm’s Laura Hazard Owen did a spot comparison on four titles shared by the two online retailers. And as of this morning, three of the four books had identical sale prices on both sites. James Patterson’s Second Honeymoon was $.28 less on Overstock than on Amazon. Meanwhile, Amazon appears to have kept pricing the same on much of its catalog that isn’t available on Overstock. 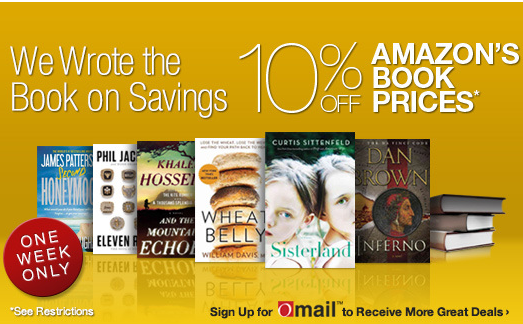 But if Overstock was hoping this promotion would help move new, big-name hardcover titles out the door, it may not be working. As GigaOm points out, Overstock’s current list of top-selling books consists predominantly of titles that have been in print for quite some time. The ads for the Overstock promotion say “one week only,” but reps for the company have not put a hard end-date on the program.